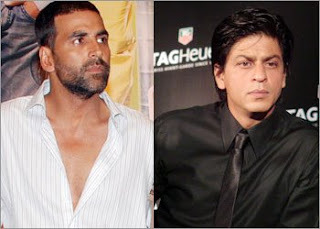 After having cold wars with Salman and Aamir, Shah Rukh seems to be targeting at Akshay Kumar. Earlier known as neither friends nor foes, Akshay and SRK are now rivals. According to Stardust, a popular magazine, SRK was after the negative publicity of Akshay Kumar’s “Chandni Chowk to China”. Aamir too in an interview revealed SRK’s great connections with media and this seems to be the reason of Akshay’s and SRK’s growing enmity. When Akshay was busy promoting his movie CC2C, SRK used his media connections to float negative publicity in various newspapers and channels. This is not the first time that Shah Rukh has sabotaged other movies, which were there to give competition to his own movies. Few years ago, when “Omkara” was about to be released with “KANK”, SRK supposedly used his media connections for circulating negative publicity of Ajay Devgan starrer “Omkara”. Akshay’s and SRK’s war is heating up and this was seen at Preity Zinta’s birthday bash, when in order to avoid SRK, Akshay Kumar left the party soon before SRK arrived. Moreover, in an interview, Akshay said that awards are manipulated if a star performs in them, hinting to the fact that SRK gets an award in a function where he performs. This fact is somewhat related to Aamir too, as in 1994, when Aamir was expecting the best actor award for his performance in “Hum Hain Rahi Pyar Ke”, Shah Rukh got it or rather stole it for his negative performance in “Baazigar”. Ever since, Aamir has rejected to be a part of any Indian award ceremony. Earlier there was a news that Akshay and SRK were keen in acting in a movie together and both In fact were about to sign a movie together but Akshay is no more interested and denied the offer. SRK has time and again been blamed for sufferings of other people in Bollywood. Take for instance, when SRK’s tour “Temptation Reloaded” was organized around the same time when Big B’s “Unforgettable Tour”, all the members of Big B’s tour suffered many problems and the blame was on SRK.